I used to look at the powder room on the first floor of our house as an inconvenient challenge. It’s so tiny you can’t really walk around in it, yet it’s the one we point guests to when they come over. It drove me nuts. So I combed through loads of interior design websites to get the best small bathroom decorating ideas. And now I’m excited to share them with you! Because of its size, a small bathroom is a golden opportunity to provide a mini-showcase of your style. Or, you can let it have its own strong character separate from your other, perhaps more neutral rooms. Here’s a great example. 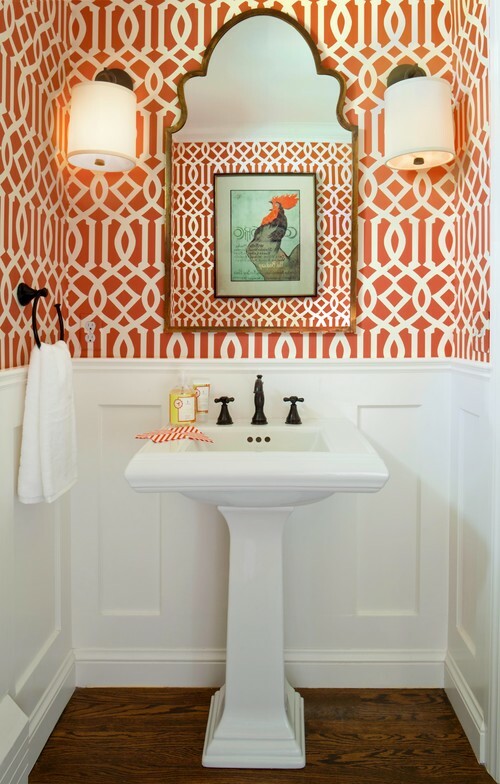 In this traditional powder room in Denver, interior designer Laura Iverson chose a strong geometric pattern in bold orange and white, giving the room pep-you-up energy on even the darkest winter day. That’s what happened here, she adds, where a coral trellis pattern complimented a traditional blue and white color theme in this Denver Southern Hills residence. I know this may sound obvious, but it’s a gentle reminder to myself, too. In a small bathroom any amount of clutter seems like too much. That includes clutter on walls with too many small picture frames that don’t coordinate well, or clutter on a shelf. You’re definitely going to need a place to store extra rolls of toilet paper, but what more do you need in there really? I’ve found that switching out a pedestal sink isn’t that expensive (in terms of labor), and well worth the money to get one that you love. When we first built our house we went for a tiny sink to match our tiny bathroom. Instead it made the bathroom seem even smaller. When we switched to a much larger pedestal sink it had the opposite effect. 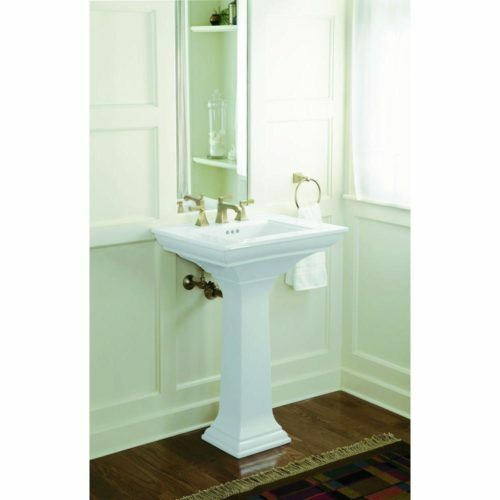 We bought one that was more classical looking, the Kohler Stately ceramic pedestal sink (shown above), and now I love it! For the $368 we spent on it, it made a big difference to me. If you have a sink built into a cabinet and want an upgrade, consider switching out the drawer knobs or pulls. I first considered this after I interviewed interior designer Kelly Wearstler, who’s a master of glam design and details. Now I do it all the time. It’s sort of like switching out jewelry, and you can really change the look without spending too much. 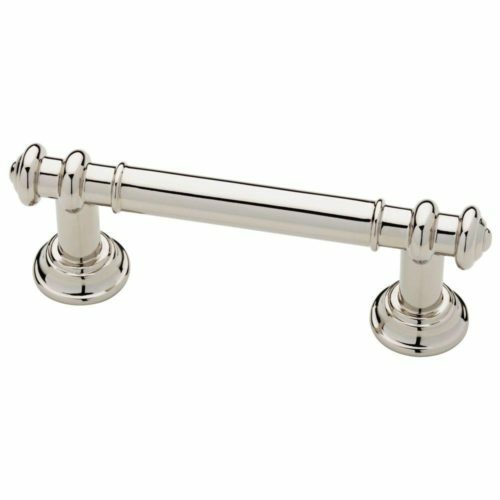 I think polished nickel can really dress up a simple cabinet, like these Martha Stewart Living finial 3-in. cabinet pulls that are only $4.50 each. For around $50 you could dress up a cabinet well with these. For something more traditional, you can easily find vintage reproductions if you don’t want to buy the originals. 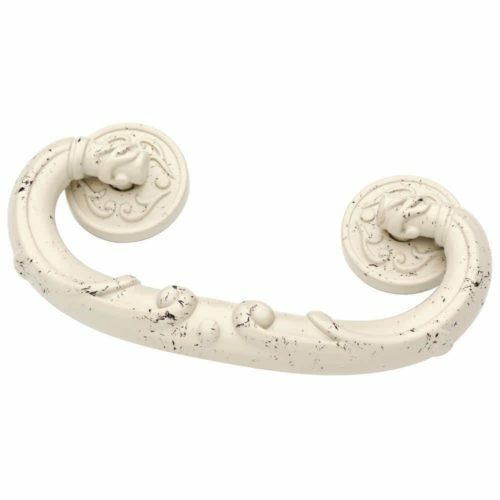 For example, I think these Liberty French Romantics pulls are an attractive play on vintage style and they’re only $7 each. You get the picture. 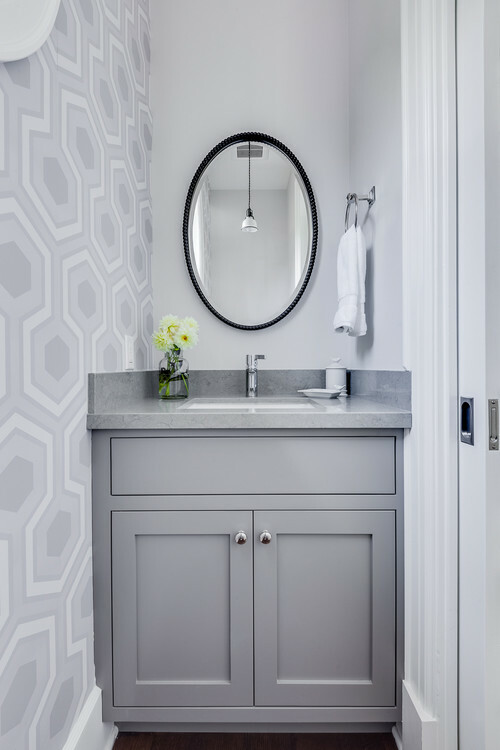 In this San Francisco powder room, Lindsay Chambers Design used a pale gray-and-white geometric wallpaper to add visual energy to the small space. The quartz cabinets and Shaker cabinet add to the transitional feel. 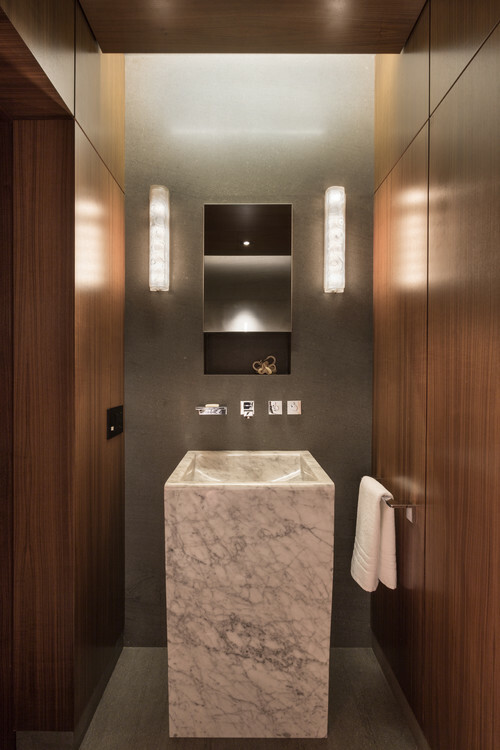 For this powder room in a scientist’s home in Miami, Touzet Studio opted for gray tile, a marble sink, and sleek wooden walls with a glossy shine that makes them almost mirror-like to the sconces’ glow. 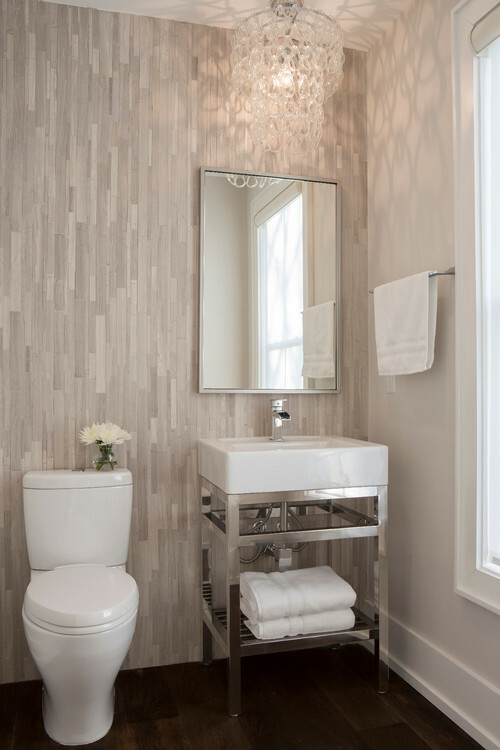 The vertical pattern in this powder room by Melissa Lenox Design reminds me of water washing down window panes. Combined with the shiny steel vanity, the sleek mirror, and the delicate chandelier, it sparkles like a diamond. When it comes to small bathroom decorating ideas, don't hesitate to consider going bold. Walls painted black can look beautiful in a traditional or modern home. 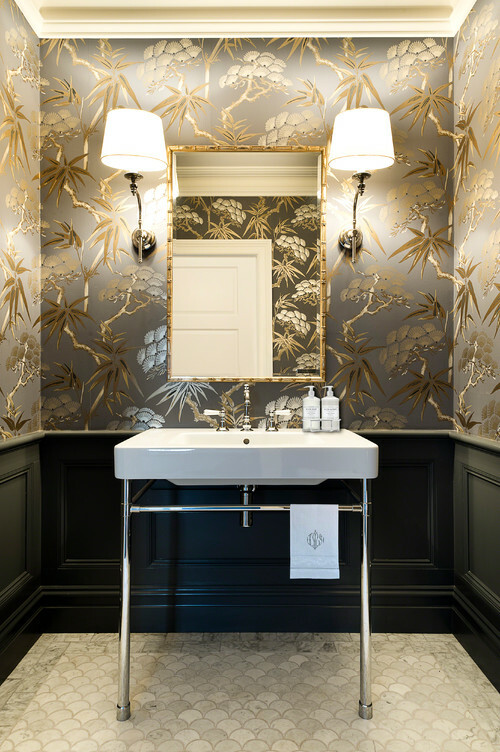 The combination of high gloss black wainscoting and the metallic, Asian-styled wallpaper give this powder room by Sydney, Australia, firm Karen Aston Design serious character. I think it has a gorgeous, Old World quality that’s very glamorous. 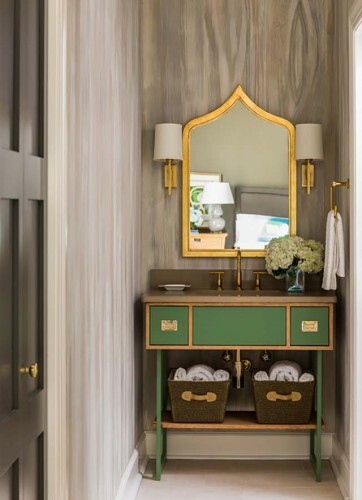 The antique gold finish on the vanity, the mirror, and the sconces unites this whimsical design by Toby Fairley Interior Design in this contemporary condo. That green lacquer draws the eye in and holds it, like an emerald. 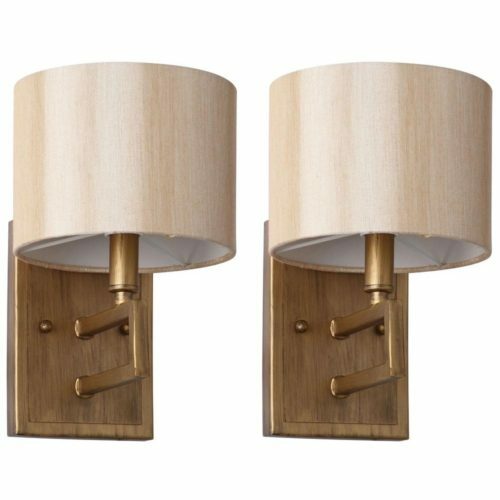 I like these Safavieh Catena antique gold sconces for the same reasons, and they’re only $110 for the set. So you don’t need to break the bank on lighting. 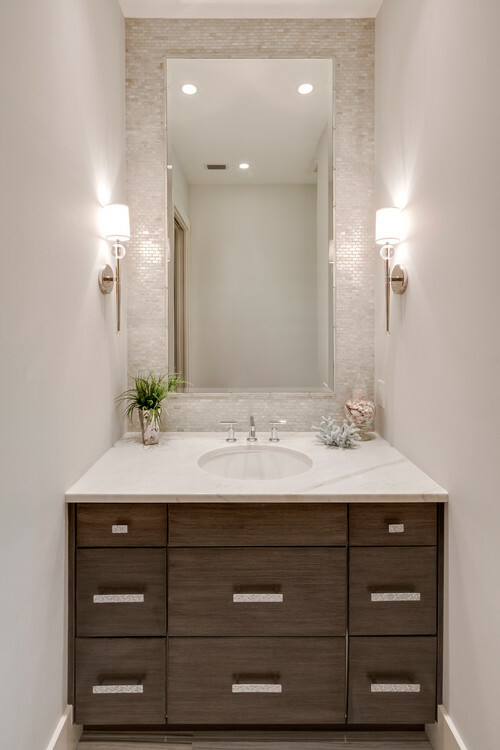 This powder room by Naples, FL, design firm 41 West is elegant and pretty, with its miniature pearlescent subway tiles glittering behind the mirror; the tiny sconces; and the blocky, dark wood vanity that contrasts with the white countertop. In my small bathroom I used mother-of-pearl tiles for the backsplash, too, and it looks great. 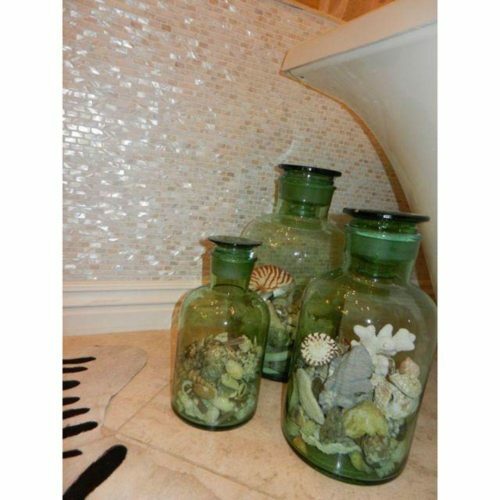 They’re easy to install yourself because they come in sheets, like this Splashback Tile mother of pearl mini brick tile. 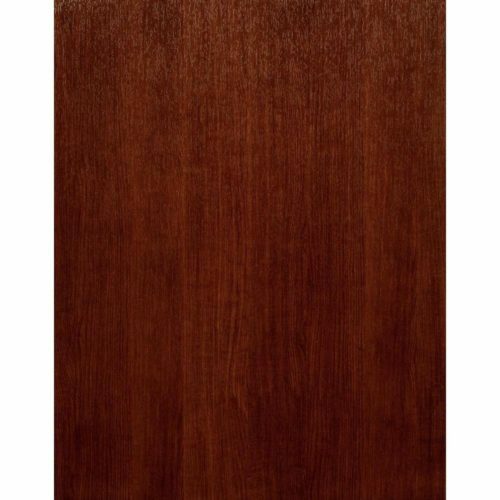 Each 11-1/4 in. width x 12-1/4 in. length x 2 mm thick piece costs $18. 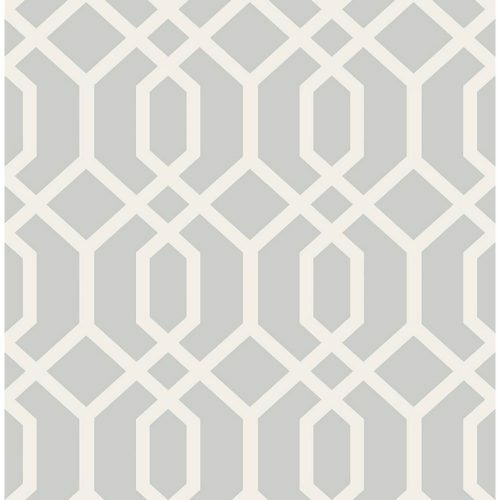 If you tile just one wall, that won’t add up to much in terms of price, but it’ll give a big wow factor. What are your favorite small bathroom decorating ideas? Leave a comment!